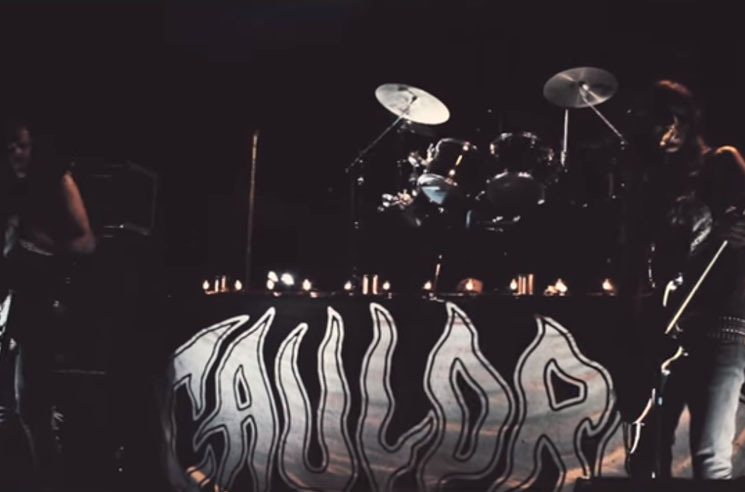 Toronto-bred metal trio Cauldron are set to unleash a new LP titled In Ruin at the start of next year, but before it arrives, the band are teasing it with a new video for "No Return / In Ruin" — and Exclaim! has got your exclusive first look at it. The new record follows up 2012's Tomorrow's Lost, and according to a press release, promises to deliver "more riffs, more attitude and more modern heavy metal classics" than anything coming out of the genre's current "imitators." It was co-produced by Chris Stringer, and lead single "No Return / In Ruin" serves as an entry point in to what the band have been up to over the last couple years. The clip itself sees the band stocking up on snacks at the local grocery store, which gives them the necessary fuel to set up a stage and then annihilate it with a live performance. Scroll past the band's upcoming tour dates to watch the show. ​We had a camera follow us around for a day so I guess you could say this video is a day in the life of Cauldron, on gig day of course. See the 'All or Nothing' video (from our Burning Fortune album) for non-gig days! After doing a couple of concept videos we decided to strip things down and go bare bones on this one. Either way, we still seem to almost get blown up! In Ruin is out January 8 through The End Records in North America and on January 29 in Europe via High Roller Records. It can be pre-ordered here.